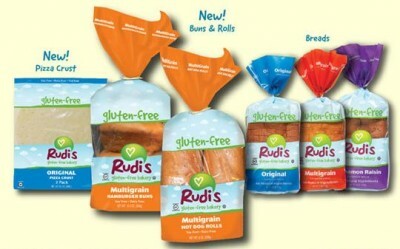 If you could have a loaf of Rudi's Gluten-Free or Organic Bread, which one would it be and why? Like the A Gift of Miles or Smart Allergy~Friendly Education's Facebook pages and answer the above question. One winner will win a FREE loaf coupon and the other will win a FREE Rudi's Sandwich Box. Kristin will choose two winners from her A Gift of Miles fans and I will choose two winners from my Smart Allergy~Friendly Education fans! Winners will be chosen via Random.org on Friday morning, November 4th. We want to thank Rudi's Gluten-Free Bakery for their support of our national telephone workshop, Holiday & Celebration FUN with Dietary Restrictions on November 12th. If by chance you have never heard of them, Rudi's Gluten-Free Bakery and Organic Bakery are MORE than just about being GLUTEN-FREE. Depending on what your dietary/allergy needs are, their products also appeal to those who are looking for MILK-FREE, EGG-FREE, SOY-FREE, NUT-FREE and KOSHER options. Besides breads, you can also find pizza crusts, hamburger and hot dog buns, bagels, english muffins and tortillas. My personal favorite is their Organic Cinnamon Raisin bread. Delicious! Don't forget to register for our workshop: Holiday & Celebration FUN with Dietary Restrictions on November 12th. I would have cinnamon raisin because sweet treats are hard to find with so many allergies. Multi grain!!! It's the first gluten free bread that I have truly loved, and made me feel like I was eating bread. Also it's the first bread in years that has not made me sick in some way or another. Thank you so very much for giving be back toast and grilled cheese sandwiches! Rudi's Gluten-free Sandwich bread is our favorite! Multigrain, because we love that one.